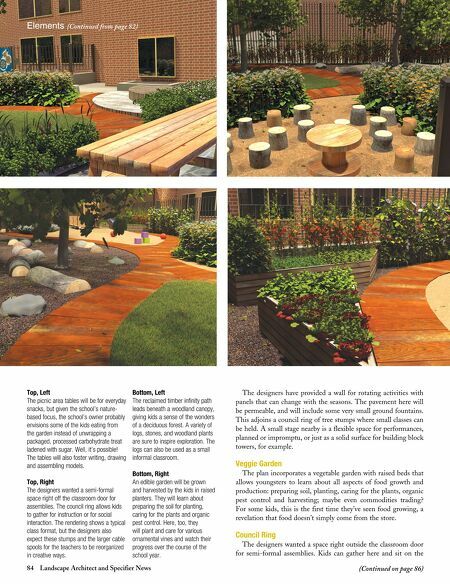 84 Landscape Architect and Specifier News (Continued on page 86) Elements (Continued from page 82) The designers have provided a wall for rotating activities with panels that can change with the seasons. The pavement here will be permeable, and will include some very small ground fountains. This adjoins a council ring of tree stumps where small classes can be held. A small stage nearby is a flexible space for performances, planned or impromptu, or just as a solid surface for building block towers, for example. Veggie Garden The plan incorporates a vegetable garden with raised beds that allows youngsters to learn about all aspects of food growth and production: preparing soil, planting, caring for the plants, organic pest control and harvesting; maybe even commodities trading? For some kids, this is the first time they've seen food growing, a revelation that food doesn't simply come from the store. Council Ring The designers wanted a space right outside the classroom door for semi-formal assemblies. Kids can gather here and sit on the Top, Left The picnic area tables will be for everyday snacks, but given the school's nature- based focus, the school's owner probably envisions some of the kids eating from the garden instead of unwrapping a packaged, processed carbohydrate treat ladened with sugar. Well, it's possible! 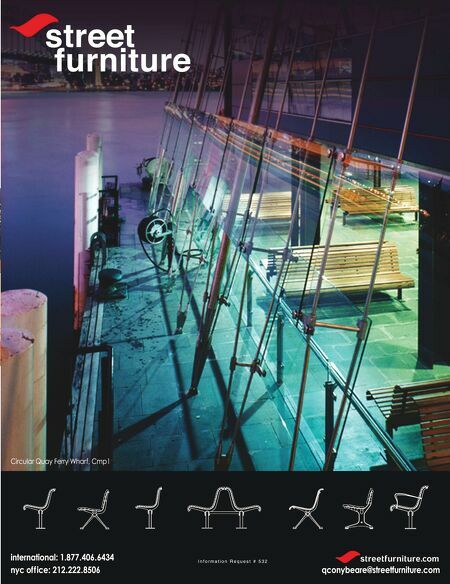 The tables will also foster writing, drawing and assembling models. Top, Right The designers wanted a semi-formal space right off the classroom door for assemblies. The council ring allows kids to gather for instruction or for social interaction. The rendering shows a typical class format, but the designers also expect these stumps and the larger cable spools for the teachers to be reorganized in creative ways. Bottom, Left The reclaimed timber infinity path leads beneath a woodland canopy, giving kids a sense of the wonders of a deciduous forest. A variety of logs, stones, and woodland plants are sure to inspire exploration. The logs can also be used as a small informal classroom. Bottom, Right An edible garden will be grown and harvested by the kids in raised planters. They will learn about preparing the soil for planting, caring for the plants and organic pest control. Here, too, they will plant and care for various ornamental vines and watch their progress over the course of the school year.